Blu Fish Fundraiser a Success! Welcome to the 2019 WGC News feed! If you wish to return to the main website, click on the "WGC HOME" button above in the horizontal navigation bar. It is the leftmost button. Your browser's "BACK" button would probably work as well. Once the 2019 Match Play Tournament starts, there will be a link here to get to those news posts. Click here for the 2018 News feed. To see news from other years, click on this link. We were rocking and rolling at our annual Spring Brunch on Thursday, March 28th at Riorden Hall. Major sponsors Darrin Hewitt from Edward Jones and Carolyn Grieve from Arvest were able to join us. Papa Mike's served up a delicious brunch! Keith Ihms spoke to us about the importance of caring for our courses. Darryl Muldoon spoke to the importance of communications. If you ever have a problem, be sure to contact the Golf Office! President Ellen Shelley opened the club's business meeting as minutes and treasurer's reports were approved. Ellen thanked award winning POA Merchandising Manager (and new member) Leslie Terry for offering this year's logo wear. Our Special Tournaments Chairs, Amy Parker and Laurie Pike, spoke about the Match Play Madness event beginning on April 25th. Everyone is encouraged to find a partner and enjoy the fun!!! Vice President Ronnie Nelson presented the 2019 Handbook. Be sure to read it this year as there are many USGA rules changes as well as changes in procedures due to the use of the Golf Software program. Deb Metz did another terrific job putting the Handbook together over the course of the winter. The WGC also welcomed 13 new and former members to the club ... the line of Big and Little Sisters stretched all the way across the Hall! We even have a mother-daughter combo which joined the club this year!!! The big winners of the day were Brenda Dandy and Betty Gilliland. Brenda won the 50-50 raffle and received over $100! Betty won the lovely WGC golf bag raffle!!! Many thanks to the social committee for all their work in putting together (and taking down) our lovely brunch. We would especially like to thank Social Committee chairs Penny Williams and Bonnie Crow. The Big Sister/Little Sister Golf Outing and Cocktail Party was held at Dogwood on March 26th. Thank you Darla Luzum and team as well as Dogwood Supervisor Paul C. Gomez! Click here for additional pictures. The Rules as Tools Workshop held on Thursday, March 21st was a big success! Thanks to Lisa Vines and her great committee, as well as our special guest speakers: Ruth Hatcher, Keith Ihms, Darryl Muldoon, Gavin Smith and Alex Sanford! Click here for more pics from the event. Do you want to play in the Eclectic again this year? This is not a WGC event, but many of you love to play in this POA sponsored tournament. However, 52 teams are needed in order to bring this tournament back to Bella Vista. It is currently penciled-in for Thursday-Friday, August 8-9. Please make a commitment and sign up NOW so we can help get this tournament firmed up on the schedule! Click here to download and print revised registration form. January 17th - Thank you, everyone who came out to support your WGC! They were busy all day and it was exciting to see so many of our community taking advantage of a great dining experience! We received a check on Friday, February 1st, for $383.55! A big thank you to Tommy Lee and Kelli McWhirt, as well as the staff that worked that evening. They all worked really hard and contributed to our successful fundraiser! Two-week event looking for more than 400 volunteers. There is still time to sign up to volunteer for this special event. FAYETTEVILLE, Ark. – Volunteer registration is now open for the 2019 NCAA Men’s and Women’s Golf Championships, being hosted by the University of Arkansas May 17 – 29 at Blessings Golf Club in Fayetteville. The hosting committee is seeking over 400 volunteers to fill a variety of roles on 19 different committees, including marshals, scorers and standard bearers. Interested volunteers are able to choose their committee and shift preference through the online registration process, and are encouraged to register early since committees and shift times are filled on a first come first serve basis. All volunteers must be 18 years of age or older and cannot be enrolled in high school to participate. She had a Hole-in-One at Country Club on Hole #14 on Tuesday, February 5th. She used a 14 wood and hit it 112 yards to the cup. Her playing partners were Jan Vogel, Verana Steckel and Bernadine Wisocki. Way to go, Marilyn!! 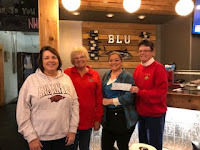 Blu Fish manager, Jennifer McAdams, presents WGC Vice President Ronnie Nelson, WGC President Ellen Shelley, and WGC Sponsorship Chair Patty Walker with a check for $171.00!! This is from our October 11, 2018, fundraiser. Thank you to all that attended!! Thank you Barry Furuseth and Ali Meneses, the owners of Blu Fish, for your Sponsorship of the BVWGC 18 Hole Ladies! Get Ready for the 2019 Rules Changes! The Rules Changes seminar has been set for Thursday, March 21st, at Highlands United Methodist Church (371 Glasgow Road). Mark your calendars now and plan to attend this informative session led by Darryl Muldoon. See below for more information on the changes. As many of you know the Rules of Golf are being modernized effective January 1, 2019. You may pick up a 2019 Rules Book at the Golf Office in the BV Country Club. Click here to go to the USGA Rules Hub for videos and explanation of the rules. Click to see the different Rule Books available. There are 3 resources on this page and all versions are available for download. To see a video of the 20 most important changes, click here.